The PressWorks Document Engine: instant contract & correspondence. SmallCo has worked with book publishers for over two decades, starting with Harvard University Press, The University of Chicago Press & Cork University Press. The Director Emerita of UNC Press at Chapel Hill memorably told the SmallCo team, “Publishing is a matter of very many details, none of which is particularly important—until it is.” SmallCo built the PressWorks family of apps to carefully tend and husband those details, ensuring their easy availability when their time arrives. Metadata Mavens use the PressWorks XML App to create custom ONIX feeds. Editorial Assistants use the PressWorks Document Engine to stay ahead on author communication. 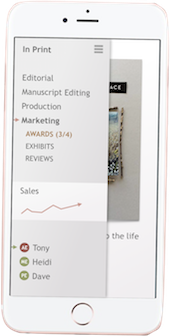 And editors use the Author App to better manage requests from authors.